>Curling is a lot of fun. 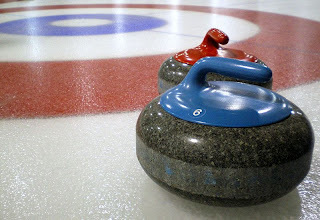 See if your local rink has curling times for the general public, or lessons for beginners. What is curling? You slide rocks (special, fancy ones with handles) down the ice and try and get them to stop in a big circle. People with special brooms can sweep in front of the rock to make it go faster and farther. It’s harder than it sounds! This activity promotes physical activity, coordination and balance.